This weekend was our last guided walk before Christmas and it turned out to me my favorite walk of the year so far! We walked from Nether Booth in the Vale of Edale up onto the southern and eastern edges of Kinder Scout. Being the highest mountain in the Peak District, it was a bit colder up there than the surrounding hills and it appeared to be the only hill with a fine dusting of snow. Combined with blue sky and brilliant sunshine, this resulted in some stunning views! Our next guided walk on Kinder Scout is on 17 March 2013 which might seem a long way ahead, but we are taking bookings now! Kinder Downfall – Going Up! This wonderful photograph was taken by one of our customers on our walk on Kinder Scout last Sunday. 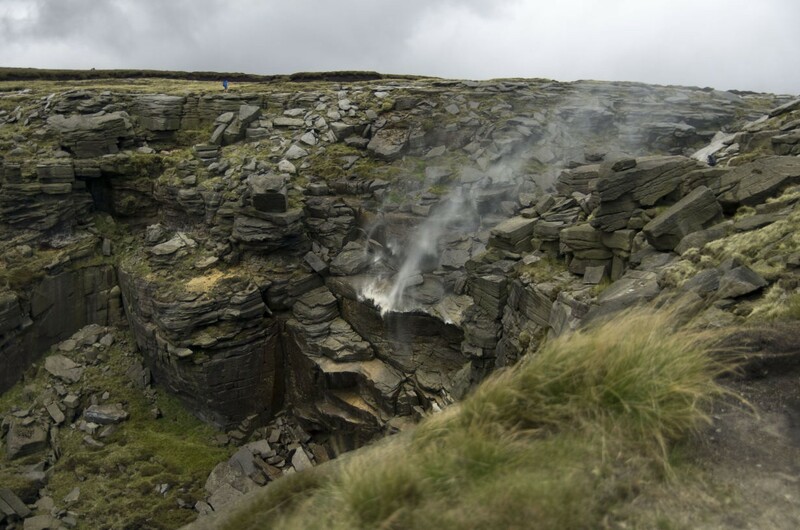 Kinder Downfall is the tallest waterfall in the Peak District, with a 30-metre fall. It lies on the River Kinder, where it flows over the edge of Kinder Scout. Although usually little more than a trickle in summer, after heavy rain it is quite impressive. Last Sunday there was a strong wind which funnelled up the clough and the water was blown back up as it started to descend. We could feel the resulting cloud of spray from a long way back as we approached the Downfall along the banks of the River Kinder. 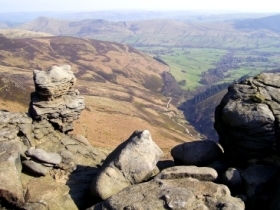 Kinder Scout is one of the most iconic landscapes in the Peak District because of its vast open moorland, the wildlife that it is home to and because it was the setting for the Mass Trespass in 1932. However, it is also one of the most damaged areas of moorland in the UK and its future is in jeopardy as a result of catastrophic wildlfires, a long history of overgrazing, air pollution and the routes that thousands of visitors have taken.